Preventing distraction and physical unease is fundamental to meditating effectively. Finding a meditation cushion that offers you the support and comfort required to sit in one position is essential. A mass-produced, low quality meditation cushion doesn’t only look bad, it will not tackle discomfort; our stylish, handmade, hand filled, organically produced meditation cushion range will. Scientific research indicates the benefits of meditation includes lowered stress, enhanced immune system and increased energy levels. Many people are not reaping these rewards due to purchasing a poor quality meditation cushion. If you are taking time out of your busy day to meditate, you deserve optimal results. This meditation cushion range is handmade by the master craftsmen of Northern Thailand (Who happen to know a thing or two about meditation). They are all individually hand stitched, ensuring a sound structure, supportive base and sturdy seams. The hand filled organic Kapok stuffing – is the most resilient, hygienic and hypoallergenic pillow stuffer on the market and is environmentally friendly to boot. Our Meditation Cushion range is tailored to offer the support you require to make the most of your meditation session. The 20.5” base gives a supportive foundation without being clumpy and intrusive. The meditation cushion design, fill, cut and size were evaluated in their production to give optimal results. A Great looking Meditation Cushion will not improve your posture but it will reduce the need for tidying. With this in mind we designed our stylish meditation cushion range to come in 4 varieties to suit the ambience of your living space. If you want to use a meditation cushion as a living room accent we have traditional – Royal Silklook and Thai Classic patterns and more contemporary Silklook, Cotton Linen and Batik patterns. Our Meditation Cushion range encompasses every style from Village Teak house to Bangkok Penthouse. 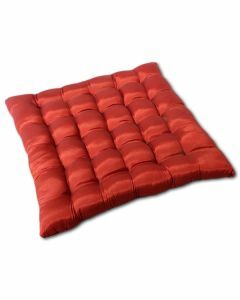 This comfortable, durable Meditation Cushion range will allow you to relax your body, mind and spirit. The stylish, intricately stitched and hand-filled meditation cushion range are sourced in Thailand but promptly shipped from our Santa Fe warehouse.